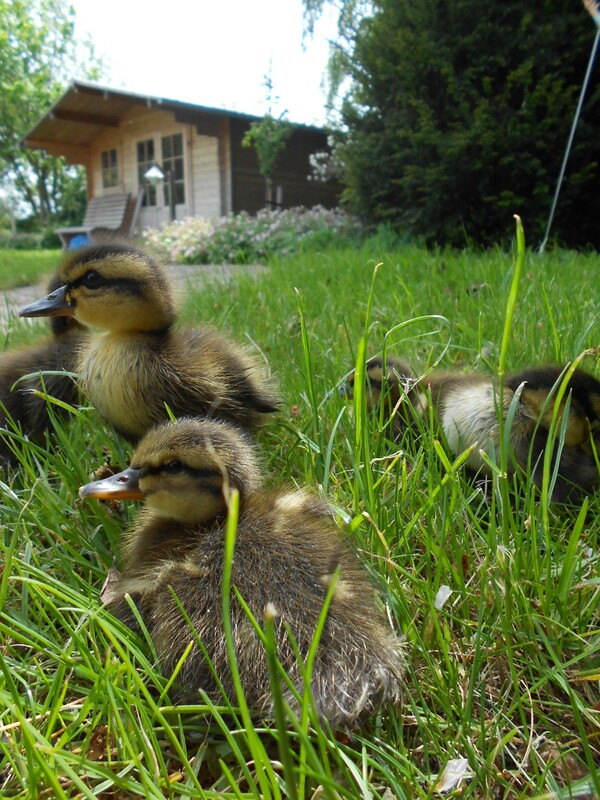 I just had a very long day – can’t believe taking care of 5 ducklings would require so much effort and time! We are trying to do our best for them, even if it means more work. At the same time, we feel very privileged as it’s not every day you will find a wild mallard’s nest in your garden and get to hatch its young and watch them grow up. I woke up this morning around 9am. At first I was afraid something had happened the ducklings in the night, they were so quiet! The sun rises very early these days so I was sure they’d be already awake. We’ve had birds die in our house before when they got accidentally trapped indoors and we were out all day – probably due to not having water and food among other factors (like nosediving into a window). 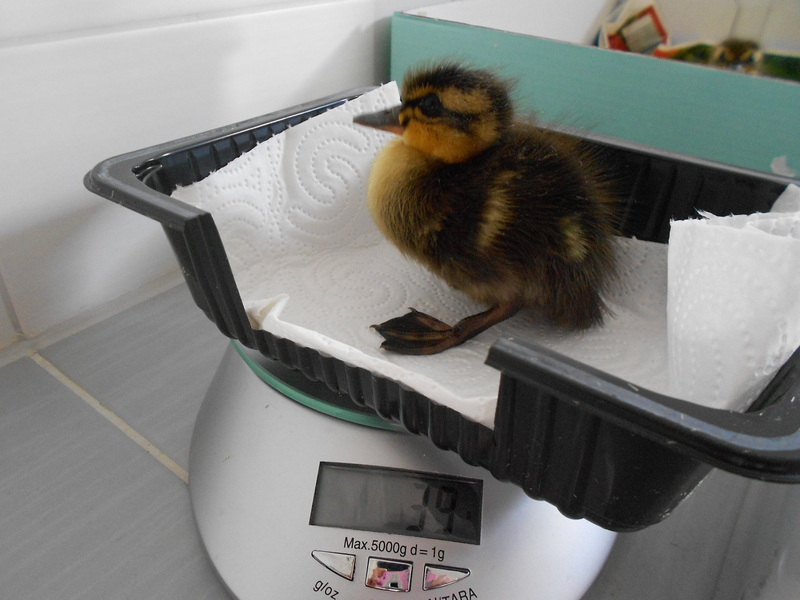 Duckling #1 weighs 39 grams! Anyway the ducklings were more than fine – they slept most of yesterday after hatching, but this morning, they were quite ready to have some adventures. The brooder box did not have enough room for so much energy! In the wild a mother duck brings her babies to the nearest water one day after they hatch, but I wasn’t sure it would work without mom giving them some of her waterproofing oils to prevent them from getting soaked to the skin and drowning. So for today, it was to be only swimming in the paint tray or bath tub where I could monitor them. First, I weighed each of them on my kitchen scales, noting that they weighed 34 to 39 grams each. The duckling who hatched from Egg #1 was naturally the largest. 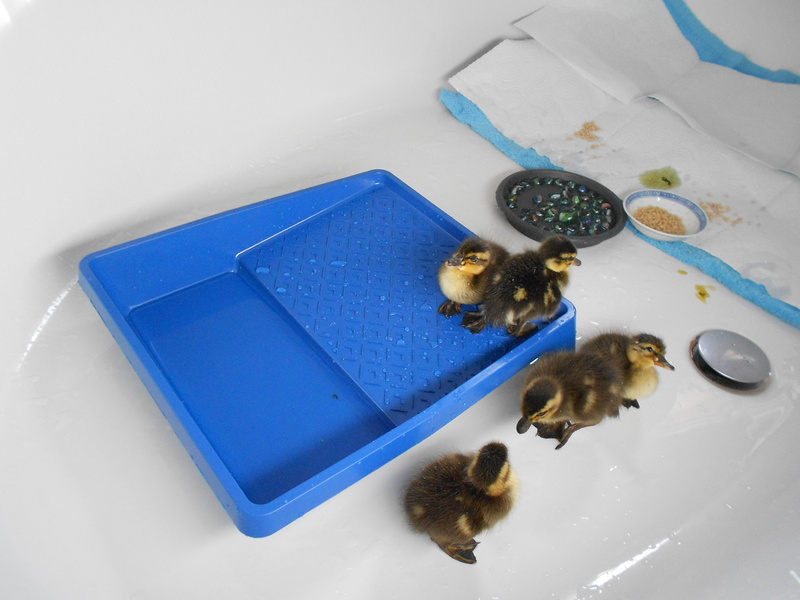 Then I put them in the bathtub and gave them a “swimming lesson” in a paint roller tray. I had bought this especially for the ducks as it had a ramp; since they are still so small they may drown if they can’t get out. I really shouldn’t have worried, these little guys sure can jump! They just bounced in and out the paint tray from the side, without even bothering with the ramp! Since everything was in the bathtub, they could make as much splashing and mess as they liked, which they did! I fed them there at the same time, with bits of dandelion greens and duck starter feed. They did peck at the food out of curiosity, but don’t seem too hungry yet. The yolk sacs they absorb during the hatching process is supposed to last them quite a while, and they are good for a few days, even if they don’t eat. But they have to drink. When they were done swimming in the paint tray, they refused to go under the heating plate which I set up for their nap, and insisted on all curling up in my arms huddled in a bunch to sleep. I was getting very sleepy too and went back to bed, and let them snuggle in a bunch on my chest. They seemed a little uncomfortable however, and kept shifting around trying to find a better position and peeping all the while, so in the end I got them all back in their brooder box, where they finally went to sleep. Later in the morning when they were awake and active again, I fed them with cooked egg yolk, and they had another short water-play session in the living room in the paint tray. I put some chopped up dandelion greens in the water – they went crazy over it. It’s amazing how well the babies can already feed themselves. After we had a late breakfast, we took them outdoors to exercise – it was very warm and sunny. 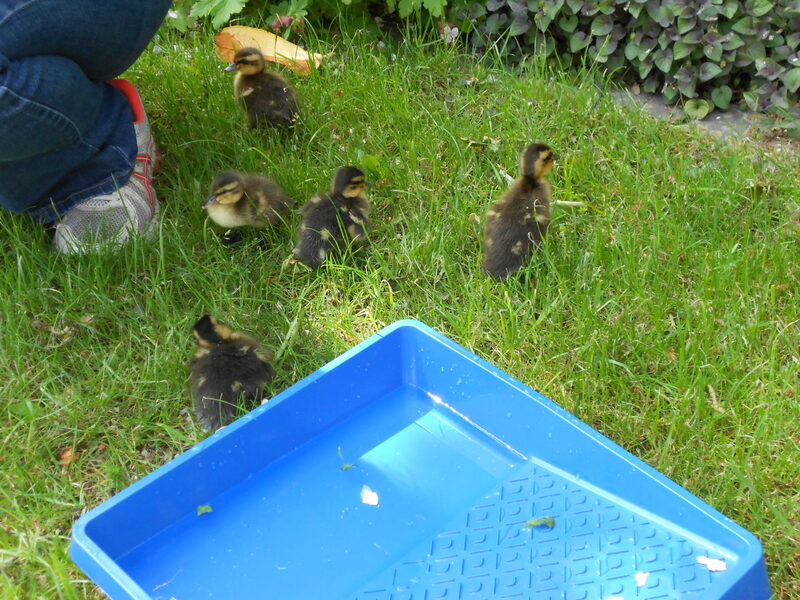 The ducklings were very distracted at first by all the bird noises and other sounds outdoors, but were excited to play in the grass, explore, eat insects and nibble at everything. They still were careful to keep close to each other, and came to me when I called. I brought them on a little walk around the garden, and they all ran so fast with their tiny legs to keep up! They looked so hilarious! I came close to the pond and was going to stop them going further – because they aren’t supposed to go swimming in the pond till they can waterproof their feathers themselves. I was guessing that would occur in a couple of weeks. But when they saw the water it was too late for me to do anything – they all rushed headlong into it -plop plop plop, one after another. None of them listened to me when I called them! Just like little kids when they see a playground! 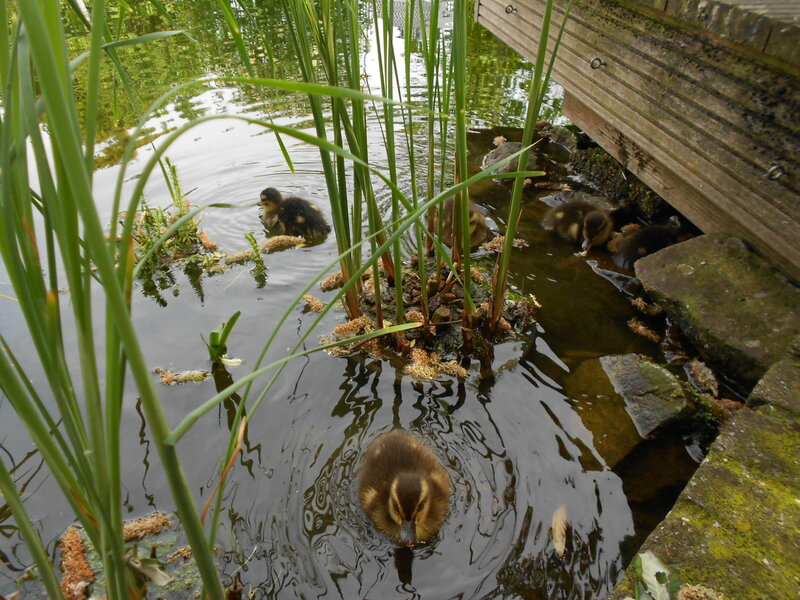 Luckily they stayed on the shallow plant shelf, and swam and played around the reeds. We stood by, ready with the pond net in case any of them strayed into the deep water and got attacked by a koi (although unlikely – our koi hardly even eat their koi pellets). The ducklings splashed around and scratched themselves on their heads using their webbed feet – they were already bathing themselves clean! Finally after they had spent quite a bit of time in their new favourite spot, the smallest of the ducklings got tired, and she jumped out and waddled up the ramp to the wooden pond deck where H. was, instead of back towards the house. They are so small they probably can’t see very far and I must look like a giant. This time, they all came out when I called – I guess they had had enough of the cold water and were tired. We walked back to the house, and I stopped at a shady grass spot to see if they wanted to spend more time outside – they all lay down and one looked really sleepy. Her eyes closing and she nodded off! It was getting cold so I walked indoors and they followed me. The first 2 ran right into the house, the other 3 were further behind, and got confused by the ramp at the door and disappeared under it instead of over it. I resisted the urge to help them out, and stood in the living room and called for them. In the wild, ducklings have to follow their mom, she doesn’t have hands to pick them up or carry them. She can only call and wait for them to catch up. We wanted them to learn as many wild instincts as possible. Quite comically, the two ducks with me also peeped really loudly at their siblings, who peeped desperately in return. Finally, they discovered how to jump over the door frame and come indoors straight to me – such clever little things, and hardly a day old! I was sure they were tired, and afraid they might get sick from being too wet or cold so put them all back in their brooder box where they preened and groomed themselves and then went to sleep under the heating plate. 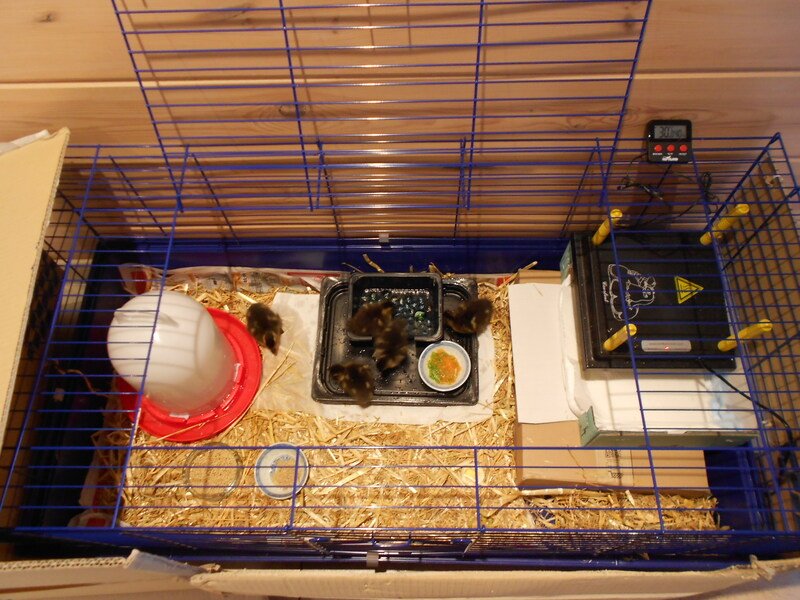 When the ducklings finally went to sleep, we went out to the hardware store to get a large rabbit cage (about 120 cm long and a third as wide) to make a more comfortable brooder for the ducks. The cardboard box they were in was hardly bigger than the heating plate and there was no place to put food and water without everything in there getting wet and soggy, so it was high time to get them new housing. That cardboard box might have been enough for one or two ducklings but not 5 very active ones! It took me a while to put the cage together and stick cardboard around the sides since the ducklings tried to squeeze out between the bars! I didn’t want a strangled duck! Inside the cage, which has a deep plastic base, I put a raised box at one end with the heating plate and soft cloth in it for them to sleep in, and hay on the floor in the remaining area, which is really big. I also put in a 5.5 litre chicken waterer, and fashioned a little drinking/wading pool (with glass marbles in it to prevent drowning/too much splashing) and a few small dishes with food – egg, chopped up veges, chick starter in some water etc. Ducks need water deep enough to dip their entire bill in to clear their sinuses or else they can get sick, and they also need water for their feet, so it’s hard to avoid wetness in their brooder – but at least I found a way to keep their sleeping area dry 🙂 They have to jump up a couple of inches to get to and from their “bed” now, but they have no problem with that! I am beginning to get used to the ducklings’ schedule. Most of their day goes this way – wake up, peep loudly until mom comes, eat and drink and run around making a big mess, peep loudly again for mom, play, groom, preen, fall asleep, wake up, jump up and down in water, eat, poop, play with water and make a big mess, groom, preen, sleep (while I clean out all the wet bedding and messed up food and water bowls) — ad nauseum. The cycle repeats every hour or so. I start to understand why new parents are always so exhausted! Somehow all this is more tiring than doing lots of housework! Anyway I am glad to report I have not yet stepped on any of the ducklings yet. They do tend to get underfoot when running to keep up with me when we are outdoors. H. thinks we should expose them to as much of the outdoors as they can handle the first few days of their lives – they need to have an imprint of their natural surroundings (and not of a cardboard box or wire cage!) and experience how it feels like in the sun and wind and in open water. I have heard of ducks who grew up afraid of water because their human foster parents were too protective and waited too long to bring them swimming. On the other hand, it can be easy for young ducks to get chilled from being in water because they don’t have the protective waterproofing oils from their mother duck. Not being able to regulate their core body temperature, they can also die from hypothermia. 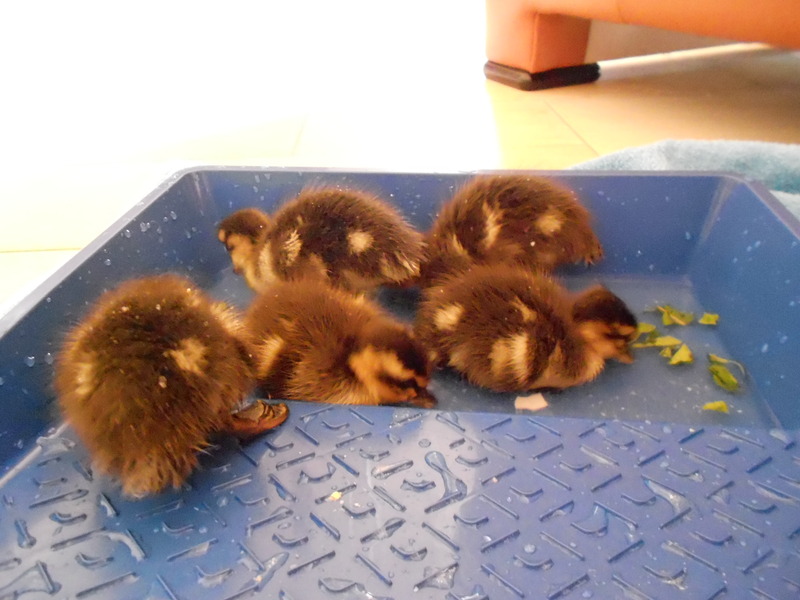 I don’t think our ducklings have any problems so far though – they are hyperactive, and already eating like pigs. It would also be better if they spent more time outdoors and in the pond instead of making a big mess in the house!